Industrial Blade Material - Tagline & Location | Carolina Knife Co. In applications where corrosion is less of an issue, 52100 tool steel is considered an ideal, affordable option, offering a very fine grain with superior edge retention. It is capable of cutting a wide range of materials because of its combination of toughness, wear-resistance, and hardness. Allow the industrial blade experts at Carolina Knife Co. to help you determine if AISI 52100 tool steel is right for your industrial cutting process. Because of its very high carbon content, 440C grade stainless knife steel is able to attain, after heat treatment, the highest hardness and wear resistance of all stainless steel alloys. This high chromium stainless steel alloy is highly rust and corrosion resistant, while maintaining its ability to take a sharp cutting edge. It is also easier to sharpen than other grades of stainless steel, making it a better choice for industrial blades. The staff at Carolina Knife Co. can help you decide which industrial blade material will work best for your cutting application. Our technicians will guide you in every step of the blade creation process; give us a call today! A2 tool steel is an air-hardened alloy containing approximately 5% chromium. It represents a middle grade of tool steel between oil hardened steels such as O1 and high carbon, high chromium steels such as D2. AISI A2 is known for its toughness and abrasion resistance while being easier to sharpen than steels with more chromium. However, because if its relatively low chromium content, A2 is less corrosion resistant and must be maintained carefully, or coated to avoid rust. Carolina Knife Co. can help you choose the right type of tool steel for your industrial cutting blades. We have decades of experience creating high-quality blades for numerous conversion industries. Allow us to help you select the right material today! ASP 23 is a high-speed tool steel containing a combination of chromium, molybdenum, tungsten, and vanadium. It is known for its wear resistance, high compressive strength, toughness, and its ability to maintain stability when heat-treated. ASP 23 is often used in thin blades, especially where abrasive or a combination of abrasive and adhesive wear is encountered. If you are unsure if ASP 23 is the right material for your industrial blade, then give the experts at Carolina Knife Co. a call today. We have extensive experience helping conversion operations select the right blade and material for their cutting applications. CPM 10V is one of the toughest, most wear-resistant tool steels available. It is produced using the patented CPM (Crucible Particle Metallurgy) process. To manufacture CPM powdered metal, the molten metal is pumped through a small nozzle and gas atomized to produce a fine powder. This powder is filtered through a screen, poured into steel containers, and heated to solidify the contents into one mass. CPM 10V was introduced for commercial use in 1978. Since then it has become the standard for high wear applications. It was designed to provide high wear resistance while retaining outstanding toughness. Note: Its toughness is equal to M2 and D2 steels, yet it has significantly increased wear resistance compared to traditional steels. CPM 10V provides a cost-effective replacement for carbide, especially in situations where tungsten carbide is not tough enough and tool breakage or edge chipping is a concern. CPM 10V is also referred to as CPM-10V and CPM10V. Similar to CPM 10V cold work tool steel, CPM 9V has a higher heat resistance and improved toughness due to its lower carbon and vanadium levels. These characteristics make CPM 9V better suited to handle problematic cutting applications where higher carbon and vanadium tool steels have insufficient toughness and heat resistance, and where other hot work steels lack sufficient wear resistance. The CPM (Crucible Particle Metallurgy) process creates a high quality, homogeneous steel that is very stable, easy to grind, and much tougher than conventional tool steels. Here at Carolina Knife Co. we can help you choose the material, which will be most cost effective for your cutting needs. Give us a call today to get us started on your blade manufacturing order today. CPM 9V is also referred to as CPM-9V and CPM9V. CPM S60V is a unique stainless steel combining a 440C base with additional carbon and vanadium for additional wear resistance. The combination of the added wear resistance and outstanding corrosion resistance make S60V (440V) an excellent option to replace traditional 440C stainless knife steel in cutting applications where increased wear resistance is needed. Carolina Knife Co. can help you select the right blade material for your cutting blades. Once the material has been selected, we will quickly manufacture a top-quality industrial blade and promptly ship it to you for rapid deployment in your conversion application. Contact us today to get started! CPM M4 is a special purpose high-speed tool steel, containing a high level of vanadium. M4 is tougher and more wear resistant than M2 and M3 in high speed cutting applications involving light cuts. CPM M4 also comes in several modifications including high carbon (HC), which offers a better hardening response during treating. Additionally, the high sulfur (HS) modification, standard in larger diameter stock, allows for improved machinability and grindability over traditional M4 steel. As with all CPM steels, CPM M4 us created using Crucible’s patented Crucible Particle Metallurgy process, which provides a highly homogeneous, stable, grindable, and tough product compared to steels created using traditional metallurgy. Whether you need an industrial blade made from a CPM steel, another type of tool steel, tungsten carbide, or even ceramic, Carolina Knife Co. has the material you need. Please give us a call today so that we can begin manufacturing your high-quality industrial blade. An air-hardened tool steel, AISI D2 contains high carbon and chromium levels. In fact D2 contains almost enough chromium to be considered stainless steel, and is often referred to as semi-stainless. Blades made from D2 are extremely abrasion resistant, because of the high carbon content, and hold their edge as well or better then industrial blades made from other materials. D2 is appropriate for most cold work applications and has a better balance of toughness and wear-resistance than most other tool steels. Selecting the correct blade material can be difficult. Please allow the experts at Carolina Knife Co. the opportunity to manufacture the right industrial blade for your specific needs. M2 high-speed tool steel is a very tough, fine-grained alloy containing high levels of tungsten and molybdenum. M2 is known for its toughness, wear resistance, and superior edge retention, making it one of the best blade materials available. The main downside of M2 is that it is difficult to grind and, because of the low chromium content, it is not rust resistant. Blades made from this material are often coated to overcome their lack of corrosion resistance. Also, adding sulfur during the creation process can significantly improve its machinablity making it easier to grind and resharpen. If you are having trouble selecting the correct material for your industrial blade, then give the experts at Carolina Knife Co. a call. We have extensive experience helping companies select the most cost effective material for your industrial cutting application. S7 steel is an air-hardened tool steel known for its high impact, shock resistance, and extreme toughness, while maintaining a relatively high hardness. S7 blades offer the toughness necessary to withstand breakage and chipping, while being hard and wear resistant enough for most conversion applications. Is S7 tool steel right for you? Allow the experts at Carolina Knife Co. to help you make this tough decision. Shop with confidence knowing that you will end up with a quality blade made from the material best suited for your cutting application. The term spring steel refers to low alloy steels with very high yield strength allowing blades and tools made from spring steel to return to their original shape after significant bending and stress. Spring steel alloys typically contain low to medium carbide levels (0.5 - 1%), similar levels of manganese, and in some cases silicon. Spring steel is the right material for high stress jobs where other blades would warp or break. If you think spring steel is right for your industrial cutting job, or you simply need assistance selecting the right material, give the experts at Carolina Knife Co. a call today. Tungsten Carbide is extremely hard, heat resistant, and stretch resistant making it useful in intensive high-run conversion processes. With a hardness equal to RC 75-80, industrial blades made from Tungsten Carbide can be expected to last 10 ?50 times longer than blades made from tool steel if you can avoid chipping or breaking the blades. All grades of carbide are susceptible to chipping and breakage, making carbide blades only appropriate for certain cutting applications. Due to its high cost and potential for breaking, many of our clients choose carbide tipped blades rather than solid carbide blades. 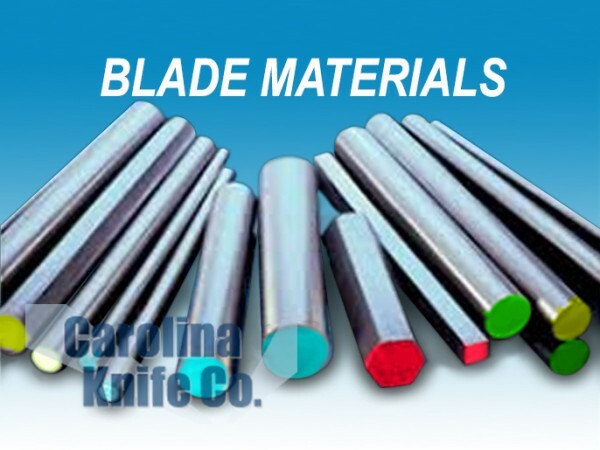 If you are considering a solid or tipped carbide blade then let the industrial blade experts at Carolina Knife choose the right grade of tungsten carbide that will provide the appropriate balance of wear resistance and toughness for your cutting application. Advancement in material quality in recent years have made ceramics a viable blade material for certain applications. Ceramic blade materials are very hard, equal to RC 75, and offer a low friction coefficient making them ideal for low shock slitting, such as film processing and certain paper conversions applications. In these low shock conversion environments ceramic blades can often hold their edge up to 100 times longer than blades made from conventional tool steels. Along with the paper and film conversion industries, these blades are also used in medical and pharmaceutical applications. Selecting the right blade material can be a challenging and intimidating process. Allow the experts at Carolina Knife Co. to guide you seamlessly through the material selection process. Whatever material suites your business best, whether it is ceramic, carbide or tool steel, we will have the materials ready to begin manufacturing your order.